Yes, Kingdom Books is in Vermont -- but New Hampshire is only seven miles from us. And we're happy fans of a New Hampshire traditional restaurant, Polly's Pancakes, in Sugar Hill, NH, about 25 miles away. 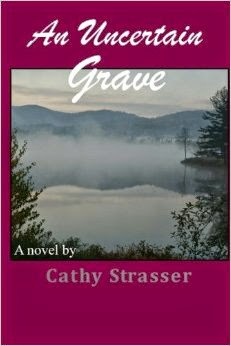 Pulled together, that explains why I'll say that Cathy Strasser, who lives in Sugar Hill, NH, is "local" to Kingdom Books ... and it also explains why a copy of her 2014 mystery AN UNCERTAIN GRAVE reached me through a neighbor on the ridge here. Strasser's first mystery (her "day job" is occupational therapy) is a good one, well plotted and paced. The first few chapters are the only ones that show up as "early writer" work -- and an attentive editor might have suggested trimming the last few pages. As the narrative swings around from a couple of directions, the story is both of police solving a crime and journalists pushing their way into it. Front and center in the book is Mt. Lafayette, for the ordinary hiker a pretty challenging mountain, visible from most of the town of Sugar Hill. When a first-time visitor literally stumbles over a decomposing body on the mountain, nearby NH State Troopers Cliff Codey and Mike Eldritch investigate. A couple of vacationing urban newspaper reporters on scene push into the investigation, looking for a hot story, or at least a way to memorialize what turns out to be a young woman's senseless death in the North Country. I enjoyed Strasser's clever and entertaining storytelling style, and although her changes among points of view -- including that of the killer -- can be a bit distracting, she's a pro at demonstrating multiple levels in her characters, including the junk-collecting but educated hermit Bonwit Felton and an intriguing side character, Kurt, whose willingness to hire emotional misfits for his lodging and rescue business turns out to be central in both the crime and Trooper Codey's growing uneasiness with the situation. There's a haunting back-story to Codey, and Strasser uses it to add to the suspense. Readers who prefer to avoid gore will find this traditional mystery a good fit -- and for those collecting New England crime fiction in particular, AN UNCERTAIN GRAVE is a must. I look forward to more from this author, and especially to more about the State Troopers she's conjured into position on her Investigative Services Bureau in one of the wilder sections of the Granite State.